Why You Should Paint Your Molding and Trim and Some Tips to Do It Right! A coat of the final paint colors are applied to the walls and the trim. The walls are painted an off-white and the trim a gloss white. Trim and molding is used to accentuate ceilings and walls. They are very useful in hiding gaps and joints as well as flaws on the said areas. They can also be used as door casings, window casings, crowns and baseboards. Whether your room's moldings and trims are made from wood or polymer plastic and regardless of their location, you will find that it is much better to paint them. It is good to paint your molding and trim with a color that is different from the color of ceiling or wall. Using shiny or glossy paint is much better. There are a variety of reasons why people opt to paint their moldings and trims and these may persuade you to do so. Painting the molding and trim in a room can brighten up the room. In fact, trim and molding is often used as a bold design statement for rooms. Painting them with a nice color that complements the color of the wall, doors and windows is a great way to enhance the room's appearance. There are different techniques that are used when painting moldings and trims. Most people decide to use a light color on moldings and trims when the wall or ceiling has a dark color. It is a great way to achieve a simple but bold style. 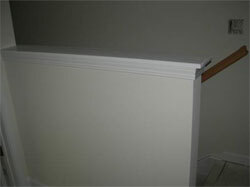 Painting the molding and trim can also help in protecting them from wear and tear. When done well, the paint on molding and trim can help in reducing breaks and cracks because moisture will have a hard time getting through the layers of paint. To use paint for protecting molding and trim, you will need to ensure that the gaps and cracks are filled in prior to painting. You may also add a stain blocker before you prime and paint. If you are convinced that painting can help in protecting your molding and trim from cracks and other damages and in beautifying them as well as the entire room, you may want to know how to do it excellently so no one will figure out that you did not hire a pro for the task. You can choose whether to paint the molding and trim before the walls and ceilings. However, painting the wall and ceilings and other larger surfaces are much easier. You will need to use a paint brush more than a paint roller. You will most likely need to sand the surface of molding and trim before priming and painting. There are techniques to complete the painting of molding and trim the right way. The first tip is to avoid bleeding (having paint beyond the moldings and trims) by using blue tape to cover the wall's area that meets the molding and trim. You can also use a painting guide for more accurate painting. Second, ensure that the surface of the molding and trim are clean and smooth especially when you sand it. Wipe or use a duster to remove sanding dust. The third tip is to stir the paint very well before anything else (i.e. dipping the brush). Doing so helps in avoiding bubbles on the paint on the surface. Fourth, paint only on a third of the brush (yes, you will be most likely using a brush when painting molding and trim). Fifth, ensure that the molding and trimming will look good by avoiding lap marks. You can avoid hideous lap marks by starting to paint in a dry area working the paint brush towards the already-painted area. Sixth, make sure that the paint will be even by applying coats as light as possible. Hopefully this article will help you make your decision on whether or not to paint your molding or trim.